This is the website for the book API Design for C++ written by Martin Reddy and published by Elsevier/Morgan Kaufmann. The book shows you how to write robust and elegant Application Programming Interfaces (APIs) with a focus on the C++ programming language. 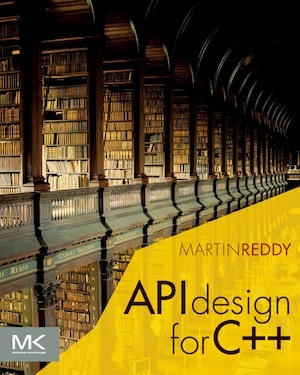 The site contains information about the book itself, as well as lots of general articles and resources on API design and evolution, including some articles on Web-based APIs and services. The book is also accompanied by a collection of source code examples that you can download for free and compile for Windows, Mac OS X, and Linux. API Diff lets you perform side-by-side visual comparisons of different API versions and produce an HTML report of everything that changed. It’s available for FREE for Windows, Mac OS X, and Linux.